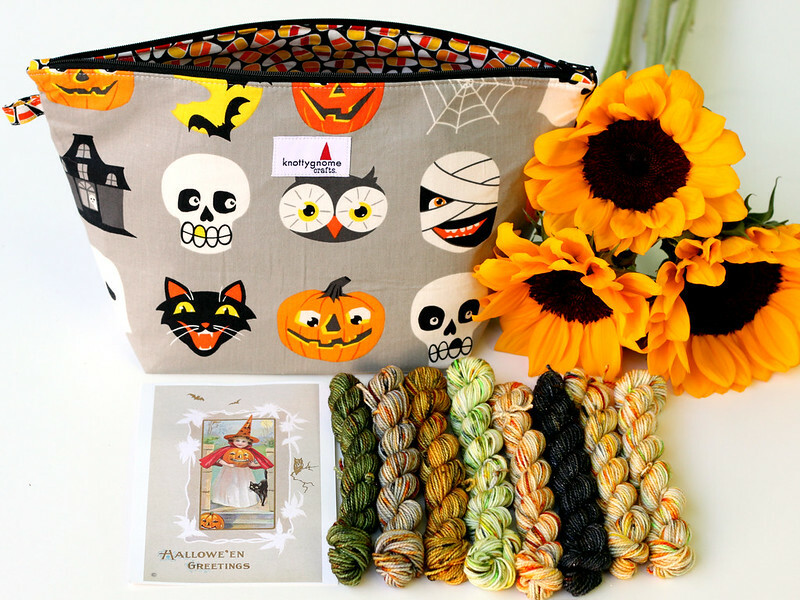 Crystal and I put together a little giveaway for you guys: one of the 2-skein Project Clutches from our Halloween kit, a set of 10g Halloween mini-skeins dyed by Sonnet of the Moon, and a cute Halloween postcard. Anyone in the world is eligible to enter. Please use Rafflecopter below for entries. The giveaway is open through Friday night and will close at 12AM Eastern time on Saturday, October (EDIT: Whoops, I meant SEPTEMBER 24). Simply leave a blog post comment letting us know what kits you'd like to see in the future. 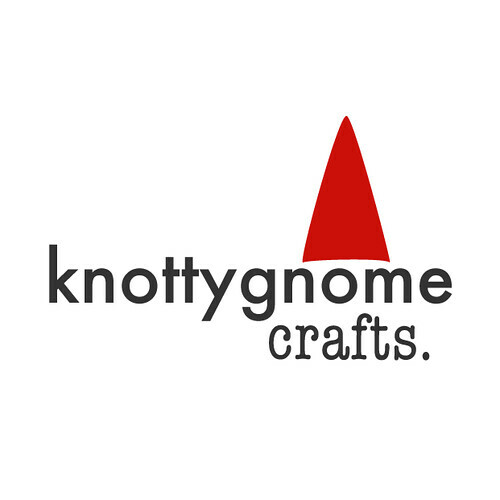 You can earn lots of bonus entries by signing up for my mailing list, visiting the shop website (can enter once a day), following Crystal and I on Instagram, and reposting the giveaway image on Instagram (found at my account, @knottygnome). Good luck and thanks for stopping by! 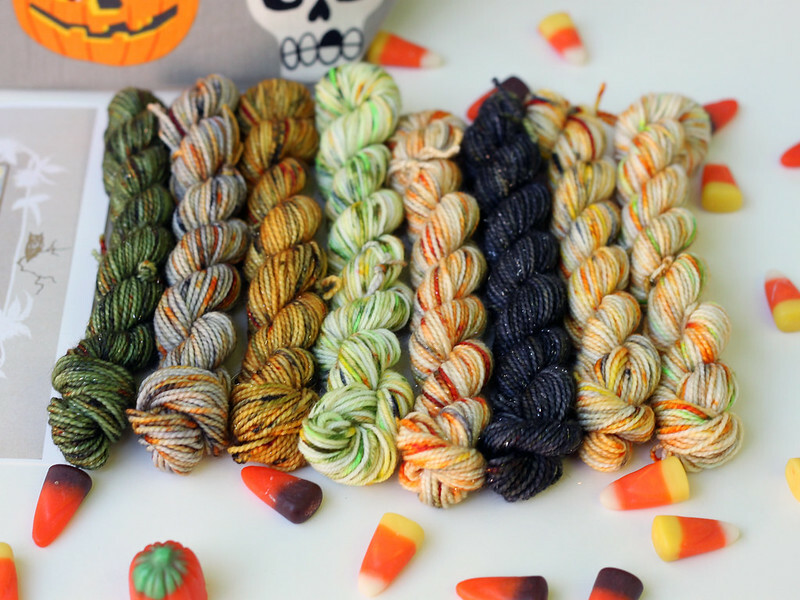 Don't forget to check out our Halloween kits in the shop. I'd like to see gender-neutral baby yarn (maybe enough for a cardi and a hat) in a basket which could be used to store the project and then be used to store nappies, etc. in the baby's room. I love the minis kits, more of those would be awesome ^_^ thanks for hosting a cool giveaway! I like mini kits too, enough for a small and quick project! I'm not picky with kits. I definitely like holiday themed ones, but also ones that fit various fandoms I enjoy. Would love to see larger sweater size bags....I have lots of smaller project bags already and it's sweater knitting season! Holiday sets are fun! I also like kits that are based off of beautiful photos or artwork. Thanks so much! a wizard of oz kit would be awesome!!! and so would a st. patrick's day kit!! Would love to see your inspirations and ideas in the yarns you dye! Thanks for the chance to win! this mini kit is a great idea... never enough Halloween... maybe mini kits based on certain artists or bands? I'd love a sock kit! Big fan of holiday kits. And minis! Maybe a larger bag or tote would be awesome. Love your patchwork bags but I imagine that's too much work for a kit. Movie-related kits would be awesome (e.g. bad 80s/90s movies we love). Or maybe life/world mysteries, based on things that can't be explained, haven't been solved, et cetera. I like so many of the ideas already suggested - especially the Wizard of Oz and holiday kits suggestions. I love all kinds of kits. Not just holidays or major themes. Maybe a random yellow kit in the dead of winter or a more subdued color palette for those with more masculine or minimalist tastes. I like everything though. All the kits all the time! Mini skein kits, Holiday kits, fandom kits, cute creatures/animals and sock kits with contrast minis for toes and heels. Seasonal kits would be nice, or music related! I would love kits that reference 80s childrens TV shows and toys, (think Fraggle Rock, Smurfs, Strawberry Shortcake - the old one, not the new, The Muppet Show etc. And mini skeins with the kits are awesome. I love the different colour ways in one set. Thanks for the chance at this super cute kit!! Themed kits are the best! I agree with another commenter, bobs burgers would be fantastic. Lol, most adultish cartoon shows are great. I'm not big on most holiday themes but you can never go wrong with Halloween. I swoon for matching bags and yarn by indie artists. Thank you for hosting such a great giveaway! I love anything teacup/teapot related, so that would be my vote! Project bags with teacups! Thanks for the chance to win! This kit is adorable! I would love to see other seasonal kits with cute retro fabrics. I really like kits for smaller items. Thanks for the cute giveaway. Love how everything fits together! I like the idea of a gloves/mittens kit. So many sock kits in the world, it'd be nice to mix it up! Seasonal kits would be a lot of fun with maybe vintage colors and fabrics. Thanks for the opportunity! How about a National Parks series? college football, MLB and maybe NFL are all great.. but always a fan of holiday kits!!! Love the idea for a wizard of oz kit or other popular movies. Halloween is my absolute favorite!! Anything Halloween in a kit is a good thing! I would love to see kits in the following themes: Outlander, Autumn, Owls/Woodlands, and Books/Reading. I love any movie themed kits! It makes it a little more exciting to have a story with your yarn! i like christmas kits and any nerdy themed or harry potter kits! I would love to see more men's knits, because I'm a guy—of course I want to knit more awesome things that I can wear! I would love to see a sophisticated palette -- neutrals and jewel tones. 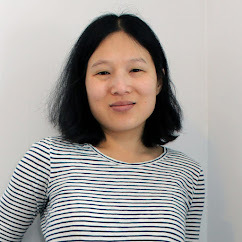 mini kits with stellina! and some glitter too, especially for adventurous knitters! Love these yarns, and the bag is adorable and looks so well made! Hmm... Maybe gradients? With sparkle!